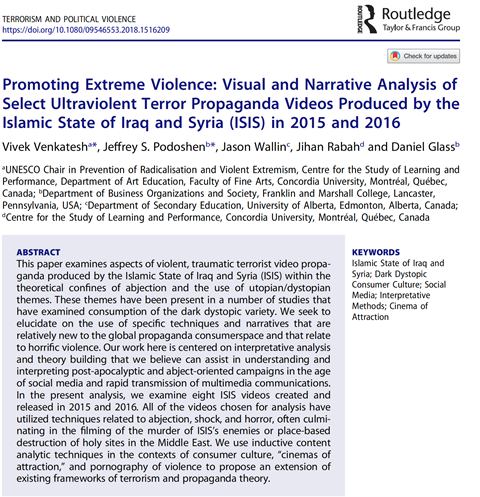 Director of Project Someone as well as the Centre for the Study of Learning and Performance at Concordia and UNESCO Co-Chair for the Prevention of Radicalisation and Violent Extremism, Vivek Venkatesh, and colleagues, examine aspects of propaganda in ISIS videos. Other Project Someone members co-authoring this article are Jeffrey Podoshen, Jason Wallin and Jihan Rabah. Jeff Podoshen talks about hate speech, freedom of expression, and IS on social media. Jihan Raban talks about hate speech, freedom of expression, and building resilience to propaganda. Through the use of discourse analysis, this podcast explores the terrorist propaganda inherent in five social media videos created and disseminated by ISIS in 2015. Terrorist groups, such as ISIS, as well as others, have long been utilizing social media to recruit youth; we need to identify, address and combat the propaganda they are disseminating. Key features of the narratives being propagated include different ways ISIS terrorists articulate and use religious scriptures to back up and defend their hypotheses and their violence. It also includes the adept use of technology, music, and cinematography to instill fear. Only by grounding the analysis of propaganda in the investigation of the discourses inherent in these videos, will we be able to create an alternative narrative to battle the deleterious impacts of these brutal messages. Please contact projectsomeone@concordia.ca to request copies of the English or French translations of the narrative in the social media videos. 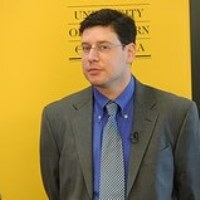 Jeff Podoshen is Associate Professor in the department of Business, Organizations and Society at Franklin and Marshall College in Lancaster, PA, USA. One of the early pioneers of the use of netnography in social sciences research, Jeff utilizes a myriad of mixed method and cutting edge qualitative techniques to distill complex data into more easily defined categories that allows for greater introspection on specific subcultures. 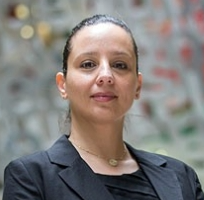 Jihan Rabah is a Mitacs postdoctoral research fellow at Concordia University. Her research interests are grounded in the affordances of digital technologies in education, specifically the intersections of liberating and/or oppressing roles social media can play in learning environments. Venkatesh, V., Podoshen, J.S., Wallin, J., Rabah, J., & Glass, D.